Q: I’ve had some insights and experiences in the past but I forget. Then there is in daily life this identification again with emotions, thoughts. Maybe you can say something about this. John: Your difficulty is quite understandable. If you had no forms, if you didn’t have a body and a self, you wouldn’t have the constant reflection back to you. You would be unstructured awareness. 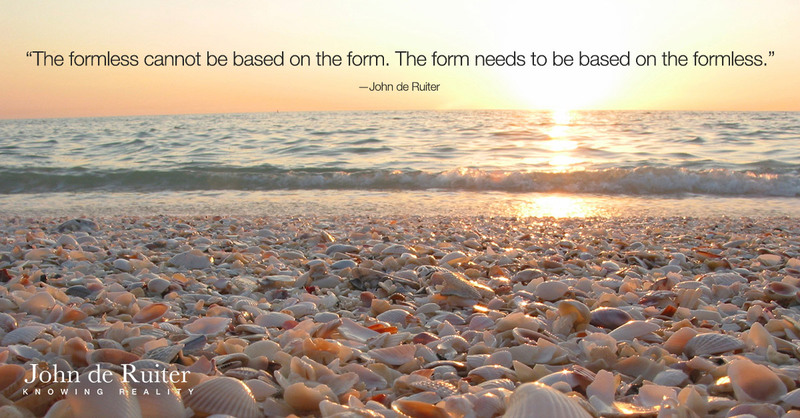 All of your forms enable you to experience what you are in form, but if that form draws you into its structures it necessarily draws you into an experience. It enables you to recognize your own beingness in your own movements. It works so well that it is profoundly difficult to realize what you are in the midst of all of that. You have an entire nervous system drawing you away from the unseen beingness. That nervous system is affected very strongly by everything that touches it. It has you experiencing pleasure and pain, attraction and aversion. Once you’ve awakened to what is deeper than all of that, awakened to some sense within of what your source is, of what you’ve come from, some sense of what you are as a being, to sustain your awareness of that is also the retraining of your nervous system, developing a self that is more like what you first are instead of just being in a self that is programmed to protect itself. For you to be what is deeper than your own nervous system you’ll be going against the experience of it. You’ll be going against your self. For you to be what you first are you will be going against what your self is. In your self and in your own nervous system you’re programmed to protect the form you have. That programming has you then experiencing that your form is you. You’re completely integrated into your form. For you as awareness to recede into the deep and to be what you first are, you will have a self that doesn’t match that. The self you have is a basic form of self. You have awareness of what is deeper in your self and what’s higher in your self, but your practice isn’t in what’s higher. Without what’s deeper in your self and higher in your self being integrated, you’ll be locked into your basic personality and your basic experience of your self. Q: But how can I integrate what I’ve experience that I am? John: You can integrate the deeper by surrendering to being it in the midst of your self. Whatever self you have, whatever kind of self you have, isn’t really a problem. It’s the form you have. For you to be within your self what you’ve awakened to puts you into profound difficulty. It has you realizing that for you to be functional in this, you need a different kind of self. You need a higher self and a deeper self. The beingness of what you first are is different than your experience of the beingness that’s most common in your self. The beingness in your self is driven by your nervous system. You’re able as awareness to be what’s different than that, but being that will be contrary to what your own self is; it will be contrary to your own nervous system. The experience of your nervous system being agitated strongly distracts you from the profound beingness that are levels deeper. The self you have and its structuring demands your attention. It demands that you not be a higher self or a deeper self. Your effort to be a higher self or a deeper self has you then as an accustomed self being in reaction to your self. It confirms the very thing that you’re trying to get away from. Trying to be a different self has you then being even more like what your accustomed self is, your everyday self. It has you being in reaction against your own self. It has you experiencing the opposite of what you long to be in your heart. Instead of looking to change something in your self, surrender your own awareness to the realization of what you are within. That has you accessing a gentled beingness within a nervous system that isn’t like that. That has you then being rested in your heart despite having a nervous system that is constantly being agitated by the positive and the negative. What you’ll be developing then is a different kind of heart than what your self is like. That has you being more aware of your heart than your self. In that, it isn’t difficult to have an open and a soft heart in the midst of a self that seems and feels closed and hard. That has you moving in your own beingness, a deeper beingness. When you surrender to opening and softening within, that has you coming into a softer and more open heart within which you’ll experience as more of a brokenness, a vulnerability. Instead of having a strength in your person, you become more acquainted with the fineness and the weakness of being. In your self, you’re programmed to relate to strength. In your being you naturally move as a very fine and tender weakness, where you don’t have the need of strength. In your self you need the strength, but needing that strength to be functional in a difficult world tends to change your orientation, where you believe that you also need to be the same deeper within. That kind of orientation distracts you from the openness and the softness, your basic deeper beingness, so you’ll keep experiencing a split-within where you’ve been awakened to a deeper kind of beingness and a knowledge of what you are, a knowledge of oneness.